Whether swooping over the treetops or diving into battle a helicopter has no equals when it comes to low level flight and landing any place that is needed. 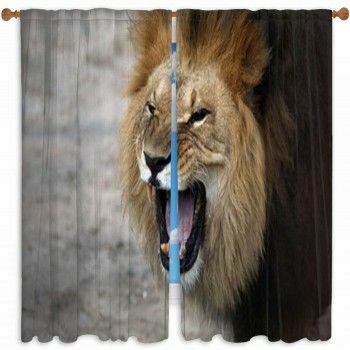 With the unmistakable sound of its rotors no matter the type of chopper they are always able to stir up more than a bit of excitement and fun. 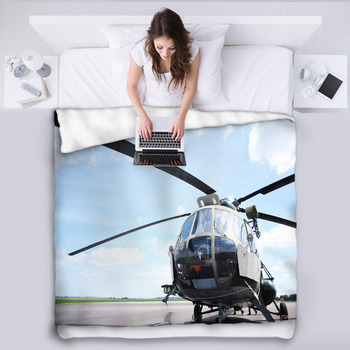 With Helicopter Blankets from Visionbedding anyone can add a piece of rotorcraft technology to a room setting it apart in a unique home decor style. 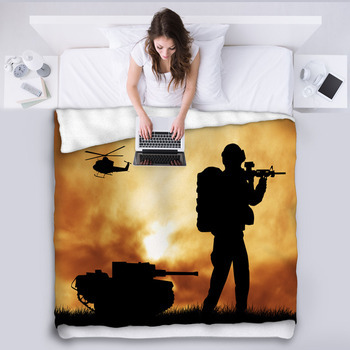 Filling the close combat support role like no other aircraft can the attack helicopters of the world make for unique one of a kind blanket designs that any military enthusiast is sure to enjoy. 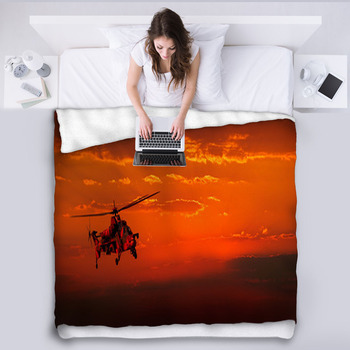 A sunset filled with Apache attack helicopters ready for battle is a blanket design like no other while a full front view of a battle ready chopper makes for an intimidating addition to any teen’s room. Apart from the attack role these specialized military helicopters also serve as combat transports. 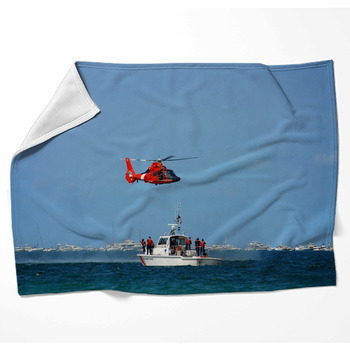 A group of troop filled helicopters lifting off an airbase makes for a helicopter blanket that is unrivaled in its sense of excitement. 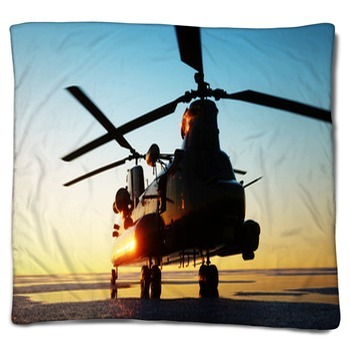 While military grade helicopters may take home all the glory on the battlefield civilian helicopters play a vital role as well. 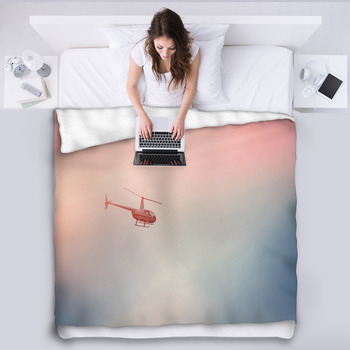 A red and white rescue helicopter speeding across a bright blue sky can be just the design that is needed to spice up a bedroom. Helicopters can really deliver the excitement by lifting those dare devil snowboarding and skiing enthusiasts to the top of any mountain ready for a thrill. 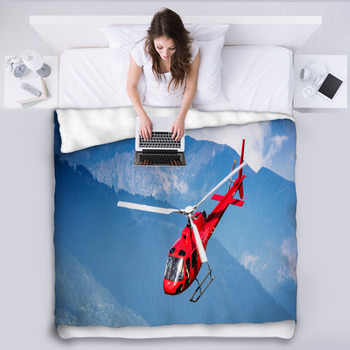 A scenic snow covered mountain design with a chopper filled full of ready and willing snowboarders ready to leap out makes a perfect addition to any winter themed teenager’s room. 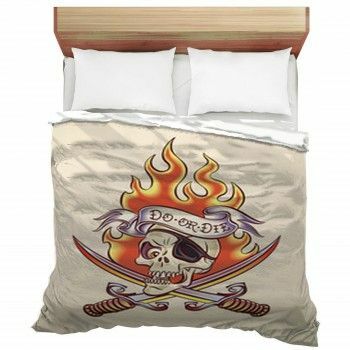 And for those chopper loving kids everywhere a cartoon design filled with flying craft is sure to add some fun.